Monterey Boats, an independently owned and family operated company located in Williston, in north central Florida, is approaching its thirtieth anniversary next year. 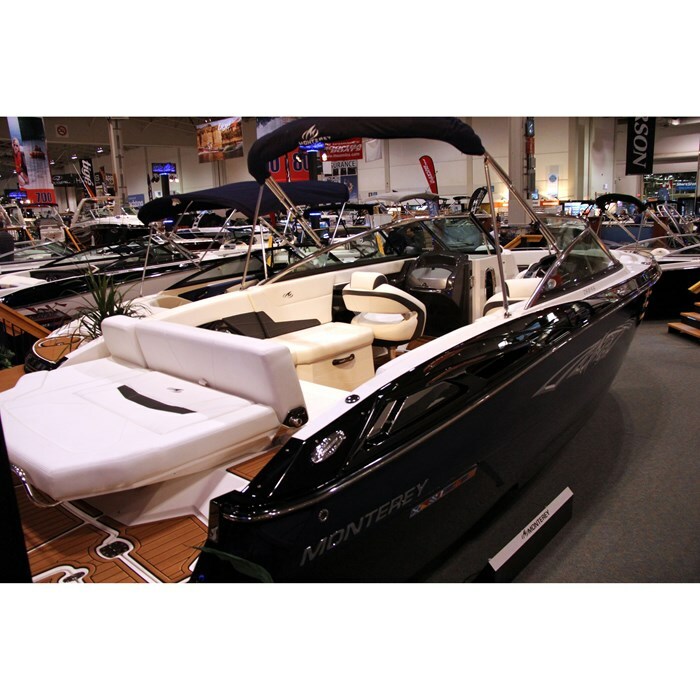 For 2014, Monterey offers a full line of thirty models of sport boats and sport yachts in four series from eighteen to forty-one feet. 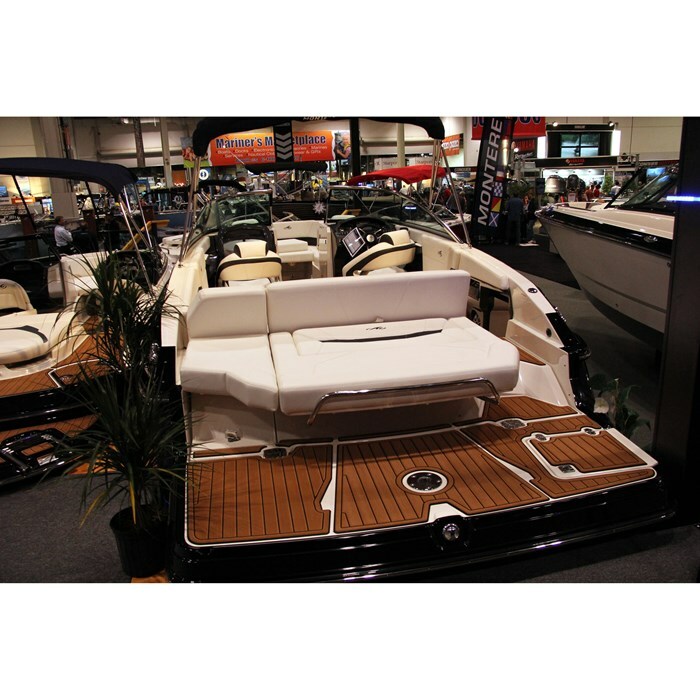 The 268 SS at twenty-six feet, eight inches length overall on an eight foot, six inch beam, is the mid-size of five Super Sport bowrider models from twenty-one to thirty-two feet. Monterey calls the 268 SS “Streamlined Beauty” and it is indeed both streamlined and beautiful in every respect from its sleek lines to its layout and functionality. 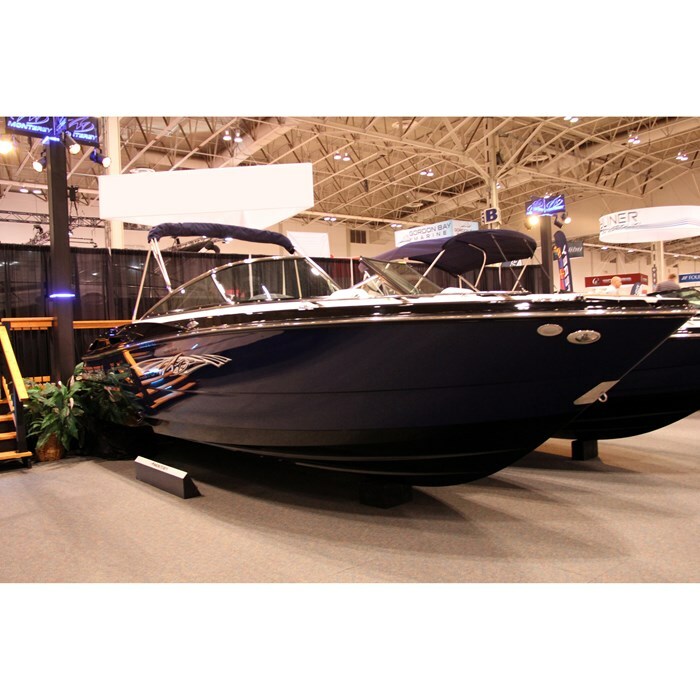 First glance will tell you this 268 SS is intended for serious watersports and family fun with its huge, full-width and low to the water integrated swim platform with recessed and covered starboard side mounted telescoping boarding ladder. This ladder location leaves the entire balance of the platform for those enjoying the large transom sunlounge with rear-facing double-wide flip-up backrest section. The aft portion of this sunlounge seat bottom is protected from scuffing with a polished stainless steel bar which can double as a safety grab rail. A stainless steel ski tow eye is standard. A transom storage compartment with gas strut assisted cover and drained bottom to keep items dry is large enough to hold a wakeboard. A starboard side transom walk-thru with opening safety door provides ready access to the non-skid fibreglass self-draining cockpit. 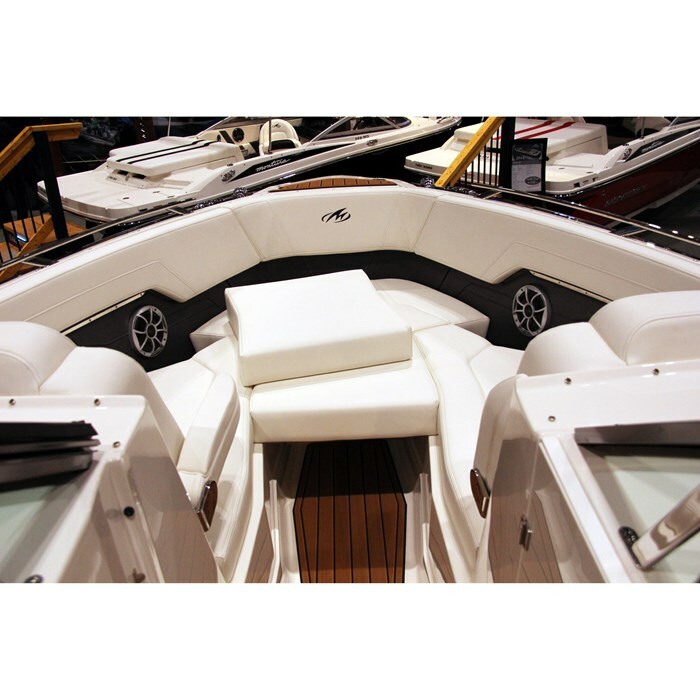 Passenger seating is provided by a portside and across the transom L-shaped lounge with storage sections. More storage is found within the cockpit side panels and ten stainless steel cupholders are strategically placed throughout the cockpit. Swivel, adjustable bucket seats with forward edge flip-up bolsters are provided for both the driver and front passenger. Between these two seats is an in-floor waterski storage compartment again with gas strut assisted lid. LED cockpit courtesy lighting in both blue and white is standard equipment. Not just one but two cockpit 25-quart carry-on coolers are also standard. Another cooler is molded-in in the bow area. The helm of the 268 SS is classy looking subdued two-toned with border stitching and a functional “eyebrow” to reduce glare onto the fog resistant gauges with low glare night lighting. Behind the sporty dual-three-spoke black with silver premium tilting steering wheel is a large central four-function sterndrive engine gauge flanked by a large speedometer and tachometer. An in-dash digital depth sounder with alarm is standard as is an MP3 adapter, stereo remote control, and top-mounted compass. A GPS/chartplotter is optional. 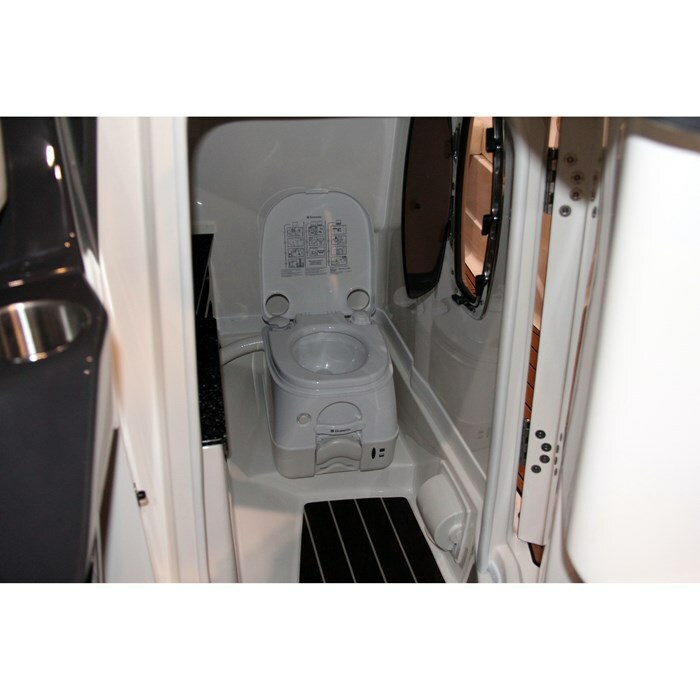 A hinged door in the passenger helm leads to a head compartment complete with a solid surface inlayed counter top, vanity with sink and pull-out sprayer, synthetic wood flooring, and porta-potti. An electric head with holding tank is optionally available. Standard bow doors lead past the opening centre section of the walk-thru windshield which has a polished stainless steel header into the fully bolstered bow area with U-shaped seating with side lounges with storage areas below. Stereo speakers, cupholders, and grab handles are all recessed within the side bolsters. A bow boarding ladder is standard as is a forward anchor locker which may be optionally equipped with an electric windlass. Additional standard equipment on the 268 SS includes a Fusion AM/FM satellite-ready stereo with iPod dock and four speakers. This may be upgraded to quite a fancy system with a transom remote. Also standard is a bimini top, a choice of coloured hull sides with deck stripe and hull side graphics, plus a vinylester barrier coat on the hull bottom. Notable optional equipment includes a black powder coated wakeboard tower with or without racks, a removable ski-tow pylon, “X” Package hull graphics, a stainless steel package with pull-up cleats plus docking lites, bow filler cushions, a cold-only transom shower, trim tabs with indicators and auto-retract, SeaDek inlay for the swim platform and/or cockpit, LED underwater lighting, a screened portlight for the head compartment, and an automatic fire extinguishing system. You may also want to consider various canvas enclosure and covering options, snap-in cockpit carpeting, a cockpit table, and a cockpit wet bar with sink, faucet, trash container and more storage. 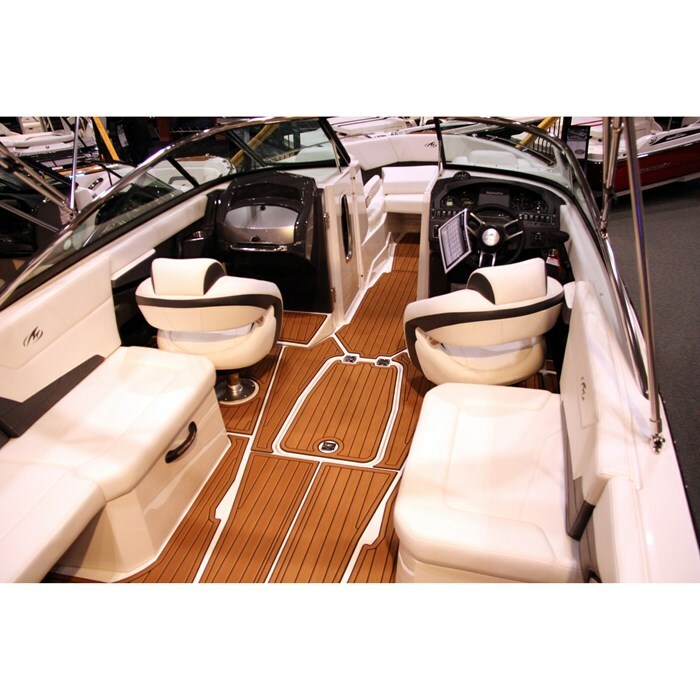 Single sterndrive power for the 268 SS is available from either MerCruiser or Volvo from 300 up to 430 horsepower. With this power range, expect top speed to range from low to mid forty’s miles per hour up to the low to mid-fifty’s with cruising speed to range from the very low to high thirty’s miles per hour. This makes the 268 SS not only sleek but also potentially fast.